I was hoping to have secret project #1 ready to share for the Blogger's Quilt Festival that Amy at Park City Girl is hosting. The good, great, wonderful news, is that I put the last stitches in it today, and I even labeled it. The bad news is that I'm not going to post photos of it until the recipient gets it. So... sometime next week. Anyway this is a bit of a recent repeat, but my scrap quilt with the purple border is my festival quilt. I made this at the beginning of this year, after a long year of not quilting much at all. I blogged about it here. Right now it is lying across the bottom of my bed, on top of our aqua and white bedspread. I'm liking the lavender and aqua together. I really like the border, and I think it's kind of funny that I had so many different purples that are so similar. I really like the back, too. In other sewing news... I found out about the FabShop Hop last month and went crazy hunting for bunnies at a bunch of online quilt shops. The grand prizes in March were 50 yards of fabric, a new sewing machine, and a really cool storage caddy. I didn't win the grand prize but I got a happy surprise this week in my email--I won a $10 gift certificate to Hidden Country Quilts. They have lots of great quilter's quality kids' fabrics, and I decided to get some sock monkey fabrics for the big quilt I'm going to be making for Jacob later in the summer or fall months. I'm working on finding bunnies for the April hop too, maybe I'll win again! this is such a cool quilt! It's amazing. I like this a lot. I've been very inspired by all the white I've seen in quilts recently and am thinking of doing one for myself! I like this quilt a lot. I often make scrap quilts. 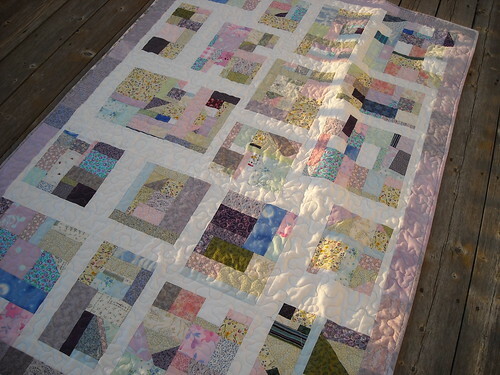 Love the scrappy look and the colours of the quilt! Thanks for sharing! Vicki, that is absolutely beautiful! I love the different patterns and colors! In fact your whole blog is beautiful and inspiring! I am still learning and love how others projects spark my own creativity, thanks! It's fascinating how the colors all worked together and I enjoyed reading about where all the pieces had come from. I want to make this quilt! I just simply love it. It must have been fun to do. Yeah we all make quilts the wrong sizes, but they end up fitting anyway. this is gorgeous, i love the different piecings in the squares. nice job! This quilt is awesome...much planning but so worth it. Thank you so much for sharing the history of the pieces used. It is gorgeous. I so enjoy your blog. Oh, I love the purples! I too am adding more white to my quilts lately. Yours has such a lovely contrast with the scrappy blocks, well done. Very nice - I should make good use of my scraps, too. I love the lavender tones. Purple is not my color, but this is so gentle. I can imagine aqua with it. I love this quilt. The colors are beautiful. Thanks for sharing. Love the quilt---the colors are great! These are the kind of quilts I really love. Using up our scraps to make something spectacular. Love it. Love your quilt. Great colors and improv piecing. I'm hoping to do a few scrap quilts myself this year after last year mostly sewing for a new grandson. Thanks for the tip about the Moda "grunge" fabrics. Lovely quilt -- the color and design is wonderful and I love how in includes all those important fabrics as well! I love the contrast between the front and the back. I've been thinking about making a purple quilt for my daughter, currently I have a purple carpenter's wheel in the words for a special needs kids camp and every time dd sees it she says "I love purple". LOL. It nice to see it put together this way. 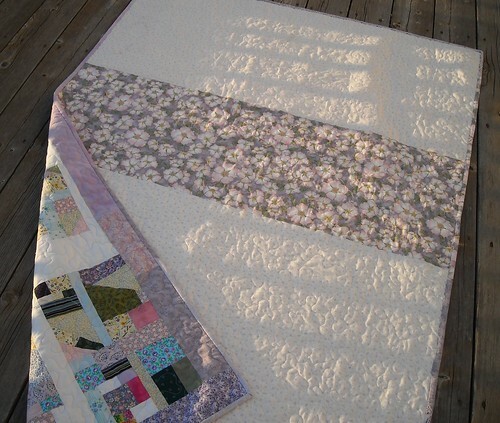 Vicki, I popped by your blog yesterday and loved your scrappy quilt! I love anything scrappy and especially the 'making somethings out of nothings' part. Beautiful job and i bet you enjoy using it. I love that your quilt has a "random but structured" style. Love it! I love this quilt...but of course I want to see the other one as well! I went and read your previous post about this quilt and I love your stories about the different memorable fabrics in your quilt! That's a lovely quilt! The scrappy look works so well. I love the scrappiness of it! Great job. Great scrap quilt. Definitely going to have to have a go at this myself. I love the soft colors in this quilt. Lavendar and lovely. Great quilt. I love scrappy quilts and yours is a beauty! So fabulous! thank you for sharing this one! I love the purple and the backing! It's wonderful! Nice work. That is a really cute quilt. I love scrap quilts...they are the best! SO pretty! Thanks for sharing - there are so many quilts to be inspired by in this festival! congrats on the hop win! i think i've told you before how much i love this quilt. i'll be looking forward to seeing your secret project! I really like the scrappiness (is that a word? )of your quilt. Thanks for stopping by my blog. The Noah's Ark quilt is SO special.